We talk to a lot of analysts. We do briefings and demonstrations on a pretty regular basis because it’s important for us to deliver our messaging directly to the analysts. On this day, we presented to Fran Howarth, Security Practice Leader for Bloor. A lot of analysts in our space are saying that security analytics products are second generation SIEMs. We disagree, as does Fran Howarth. She’s written a report on The Ongoing Evolution of SIEM which you should read. 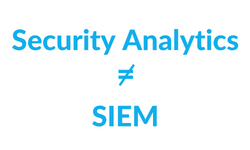 A Security Analytics product can do a lot of what a SIEM can do, but it does a whole lot more. It not only looks at activities, it also looks at access. It has the ability to help facilitate risk based orchestration within an organization. It applies different levels of controls and provides risk scores and other opportunities to make business decisions. Gurucul is laser focused on security analytics. When you hear our messaging, you’ll hear us talking more and more about security analytics and behavior analytics. We are purposely not positioning our product as a SIEM – to the dismay of some analysts. We generate a single risk score for every user and entity in your organization using behavior analytics. Why is that important? It’s important because you can focus on the highest risk areas in your organization. This enables you to automatically orchestrate downstream actions and apply automated risk-based controls. Didn’t You Say Something About a Demo? During our briefing with Fran Howarth, we started with a presentation, followed by a demonstration of our behavior based security analytics platform. We talked about all the points mentioned here and then showed Fran how it works in practice. What can we say? We give good demo. Request yours today! At Black Hat USA this year, Gurucul shared details of our most popular Machine Learning Models. Every hour at Black Hat we revealed a new Machine Learning Model. It was fun. It was successful. It was #MachineLearningMadness! Over the course of 2 days, we presented 14 different Machine Learning Models. Please check our blog regularly over the next few months for in depth details on how each of these models work. Click below to view the list of models. It is estimated that a whopping 81% of hacking-related breaches use either stolen and/or weak passwords making identity a core issue of modern threats. Organizations with IT resources that span the data center and cloud are especially prone to struggle to detect and prevent unauthorized data transfer and user privilege abuse across their hybrid IT infrastructures, whether they have hybrid cloud and/or hybrid data center environments. Today we are reviewing Gurucul Risk Analytics (GRA), a security analytics solution that helps organizations protect themselves against insider threats, account compromise, IP and data theft, external attacks, and data exfiltration. One of GRA’s unique capabilities is that the solution spans on-premise and the cloud, and supports open choice of big data repositories. GRA’s security intelligence and analytics technology incorporates machine learning, anomaly detection and predictive risk-scoring algorithms to reduce the attack surface for accounts, unnecessary access rights and privileges, and to identify, predict and prevent breaches. GRA monitors user behaviors using machine learning algorithms to detect threats that appear as “normal” activity to traditional security products, such as hackers using login credentials stolen from authorized users, as well as malicious insiders, employees and contractors. BLOG: A Q&A With Our CEO About Insider Threats. Saryu Nayyar, our CEO, was contacted by a reporter to provide comments on an Insider Threat story. The reporter sent Ms. Nayyar a list of questions on insider threats. Here are her responses to some of those questions. Read More. Detect Insider Threats With “Email Fuzzy Logic”. This is the first of 14 Machine Learning Models we presented at the Black Hat conference. How does the Email Fuzzy Logic machine learning model work, what does it do? This model will sniff its way through company email systems to detect whether a user is sending emails to his or her own personal email address, or to other non-company email addresses. Read More. Gartner Security & Risk Management Summit – India. August 30​-31​, 2018​. Renaissance Mumbai Convention Centre Hotel, Powai Mumbai. Get the latest information on new threats as well as insights to help you prepare for emerging technologies such as artificial intelligence (AI), machine learning, advanced analytics and blockchain. Meet our local sales and support team at our booth.